Description: If you sit in a pew, Sunday by Sunday, you will hear parts of Matthew's Gospel read. But you might never have read it yourself from start to finish. And if you are not a churchgoer, you might not think to read any of it. Yet it has been, and continues to be, an important part of our heritage. This book considers a group of people who meet, week by week, to try to untangle what Matthew is about. A complete text of the Gospel is included in this book and many questions are raised, the kind that you and I might ask. Some conclusions are reached; many issues remain. But no one goes away unchanged. Endorsements: ""Perhaps because the author has a foot in at least two worlds, that of mathematics and religion, he has been able to take one of the great foundational writings of Christianity, the Gospel according to St. Matthew, and, through the experiences of a circle of deceptively ordinary men and women, to make its pages not only instruct us, but also move us. When we have read this book we have not only learned more about the world of early Christianity, we have learned much about human nature, not least our own."" -Herbert O'Driscoll, Warden Emeritus of the Cathedral College, Washington D.C. ""Sel Caradus presents a group of laypeople reading Matthew's Gospel. They are free to ask their questions and leave answers open. The questions they ask are those you would have, their answers unpretentious. The characters get to you. They change in the process and slowly grow in mutual trust and affection. The author has made their journey credible, instructive, and pleasurable."" - Dan Fraikin, Professor Emeritus of Greek and New Testament, School of Religion, Queen's University About the Contributor(s): Sel Caradus (PhD in Mathematics, UCLA; MTS, Queen's Theological College) is an Honorary Assistant at Christ Church Cathedral in Victoria, British Columbia. He is the author of A Campus Ministry Primer (1986), A Temple Not Made with Hands: A History of Christ Church Cathedral (2004), and A Life of George Hills: First Bishop of British Columbia (2008). 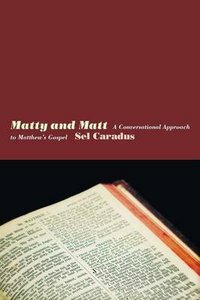 About "Matty and Matt: A Conversational Approach to Matthews Gospel"
Sel Caradus (PhD in Mathematics, UCLA; MTS, Queen's Theological College) is an Honorary Assistant at Christ Church Cathedral in Victoria, British Columbia. He is the author of A Campus Ministry Primer (1986), A Temple Not Made with Hands: A History of Christ Church Cathedral (2004), and A Life of George Hills: First Bishop of British Columbia (2008).